Don'ts- Don't push the mop with force in locked state while trying to spin as it can damage the locking and spinning mechanism of the mop. Always ensure that mop is unlocked before spinning in the bucket wringer. Super Fast and Efficient Cleaning like never before for efficient wet and dry cleaning, buy the Esquire Elegant Spin Mop that offers a super absorbent mop that can help you clean all the difficult areas of the house like under the refrigerator, bathroom corners and others. The mop handle can be adjusted from 45 to 180 degrees for more comfortable cleaning. Durable and Long Lasting Mop Heads. 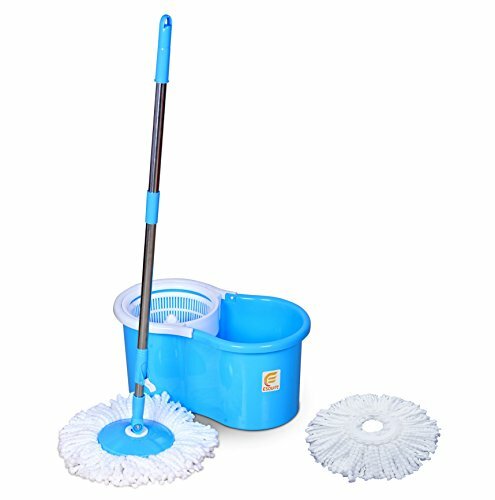 Esquire Spin Mop is available with two mop heads, made of high quality microfiber, making it easy for you to clean them and maintain. Keep away your hands from the dirty water and save your back from backaches while cleaning and mopping.